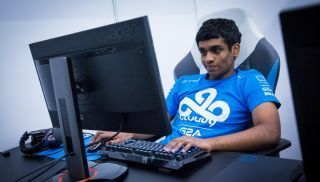 Cloud9 fires Ravindu "Ritsu" Kodippili for "out-of-game conduct"
Dota 2 pro Ravindu "Ritsu" Kodippili has been fired from Cloud9 following allegations that he leaked strategies and information about a rival team to another rival team. As noted by Kotaku and detailed on Reddit, the allegations first came to light last week, when Team Secret player Jacky "EternaLEnVy" Mao tweeted an image of a chat log showing Kodippili sharing information about Digital Chaos with other players in an effort to keep it from qualifying for The Summit 4 tournament. Cloud9 didn't reference the leaks specifically when it announced Kodippili's dismissal, but team captain Theeban "1437" Siva said that "the indiscretions of [Kodippili's] past inevitably lead towards this outcome. His recent efforts to improve his behavior came too late and following our elimination from the Major, it was determined that Cloud9 was no longer the place for him to be." Cloud9 General Manager Danan Flander echoed that sentiment, adding, "Events preceding the attendance of the Frankfurt Major weighed heavily on both Ritsu and Cloud9 as an organization. His out-of-game conduct was consistently unbecoming of a professional player and although he began taking steps to change himself and how he interacted with the DOTA2 competitive community, his past indiscretions combined were too much for Theeban, myself, and the rest of the organization to overlook moving towards the next Major." The information that was allegedly leaked would have been gleaned during scrimmage matches between Cloud9 and Digital Chaos, and while sharing secrets apparently isn't against the rules, it is in very bad form. It's another example of bad behavior in professional esports that, unfortunately for Kodippili, the maturing scene is growing less and less tolerant of.